This beer pours a bold, dark yellow with some lacing. The smell is bold, too, with some floral and citrus notes. The taste follows suit, but is not very bitter for a beer of nearly 8 percent alcohol. Big thick hazy juicy ipa that holds up to the upper mid range of the New England breweries. Beautiful hazy pour. Delicious but could be more hoppy. Good lacing on the glass. Nice thick mouthfeel that you just want to chew - exactly how a NEIPA should be. Great stuff! Massive foam when poured into my stein (probably not the best glassware choice). Completely opaque - like the atmosphere of Titan. Not much on the nose, but i do detect faint pineapple, guava, mango scents. Taste is incredibly smooth and more of the hop complexity comes through with grass and pine notes. Not bitter at all (as advertised). This one is easy drinking for such a high ABV. Kinda scary! Poured from bottle dated 6/29/18. Appearance is opaque, pale orange with head that thinned quickly. Predominant smell is of orange, with a touch of pineapple or other tropical fruit. Flavor has more of the orange with some definite resinous quality. Overall - Appearance is very nice, but it seems a little one dimensional in terms of smell and flavor. Also maybe a bit unbalanced. Beer is still quite enjoyable, though. I just wouldn't be able to drink more than one. There is a date stamped to the bottle: "06/29/18"
Appearance: The beer pours this awkward looking milky pale straw color straight from the bottle. It pours into the glass as a completely opaque pale straw-gold. Shadows can't even pass through. The head is short but pure white with very good lacing. The head has these large bubbles and it is reminiscent of tapioca pudding. Aroma: The beer has a strong catty aroma full of garlic and onions. There is an odd addition of summer squash as the nose lingers for a bit. It smells a bit like a well-seasoned vegetable soup. There is also a very strong aroma which smells like the oil that laces the outside of a hop bine. At irregular intervals there are faint wafts of alcohol. Taste: The flavor of the beer favors the character that can only be described as hop bine oil. There is a very light touch of pineapple skin flavor (without the pineapple meat). There is also this under-ripe corn flavor at the end and a grassy character which is unsettling. Mouthfeel: The beer feels very soupy and thick. It isn't very pleasant to drink because it feels too weighty. I want more of the hop flavor but the sacrifice is another spoonful of tomato soup. 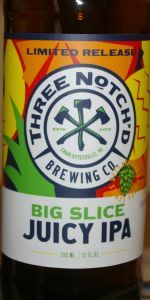 Overall: It is overwhelmingly obvious that this is Three Notch'd Brewing Company's attempt at a New England Style IPA. The color is there and the mouthfeel is a bit too much there. From the aroma perspective the beer has a pretty good amount of character. The longer you linger on the nose the more attracted to it you will become. The downside is that from time to time it will smell like various vegetables. From a flavor perspective it is also pretty good although it tends to be a bit too grassy. There is a nice pineapple flavor but you have to really search for it under a mound of fresh cut greens and dried hay. Overall it is a beer that has some pretty good qualities that sometimes rest on the "above average" level and other times rest on the "average" level. I would say it's worth picking up but I probably wouldn't buy more than a couple of bottles. A: pretty interesting looking. Nice bright white persistent head that laces heavily. It has a great bright straw color that is highly opaque...too much to call it cloudy exactly. More like a pineapple juice almost. T: the taste is a letdown for me. It's a bit too weak and flat up front. A little sweet, (and very flat as it warms). The bitterness follows but its not that pleasing and a bit weak. You get the grapefruit rind but it just somehow clashes with the flavors that hit first or it just is too little too late. I dont have the words to describe it, but it is a bit disappointing. I now notice on the bottle now it says 15 ibus, and I might have expected this if I saw it to begin with. O:overall the taste carries the most weight, and even though it's an interesting looking beer and smells great it's just not there for me. However, it's definitely enough to get me interested in trying more from this brewery. Pours a faded orange-yellow cloud - looks good for a NE IPA, but the faded nature adds a dirtiness to it. The head is a decent height on an average pour, and does supply some nice lacing. Nose is exactly like a morning juice blend - pineapple, clementine orange, tangerine, papaya, and a splash of grapefruit. I believe this is pretty fresh, and the scents do jump a bit initially. There's a little pine spice hiding in there, as well - almost a little like a car air freshener - which probably sounds bad, but it's not given how it's mixed in. Note: when I sampled it, I noted banana on the nose and was told a Hefe yeast was used; I'm not getting as much banana in this glass, oddly - only a little as it warms. Taste has a little sweetness in it, which is almost certainly coming from the lactose. I think this might have helped boost the sweeter fruit notes in the nose. The fruitiness is more muted in the taste, with the celemntine and more dull pineapple still there, but in a bit of a haze with the lactose, perhaps a little oat, and a light pithiness (orange and grapefruit). Warmth brings out some banana notes. A fairly smooth feel up front, but with a near prickly feel in back. The pine is subtle, but sneaks in with some more bitter pithiness in back. Nicely balanced - some sweetness up front, some bitterness in back, but nothing extreme on either side, and a nice little transition between the two. From the bottle, it pours a really hazy yellowy amber with a nice head, which last a good bit. Lots and lots of citrusy hops in the nose. The mouth gets a nice slightly bitter and lemony flavored IA! It leans towards a balanced east coast ipa.